IT’S MOSTLY ABOUT THE MEMORIES, I’ve decided. 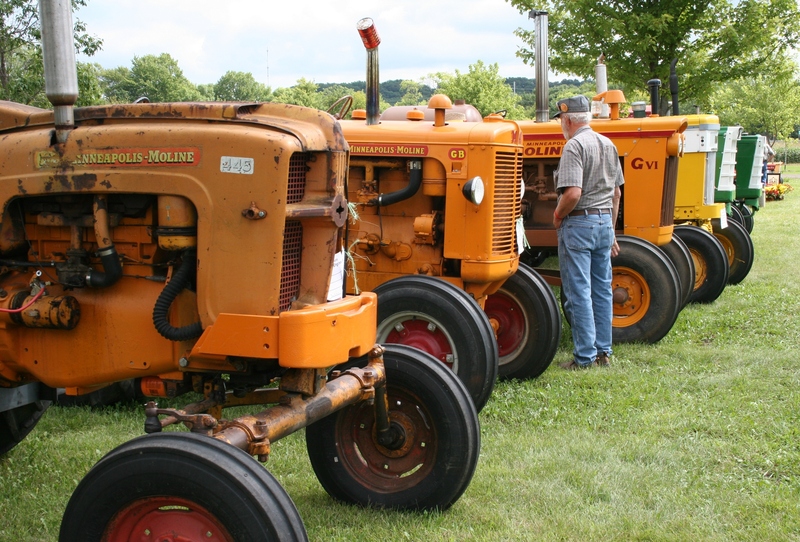 A snippet of the tractors and more displayed at the Rice County Steam & Gas Engines Show. A sign along Highway 3 welcomes visitors. 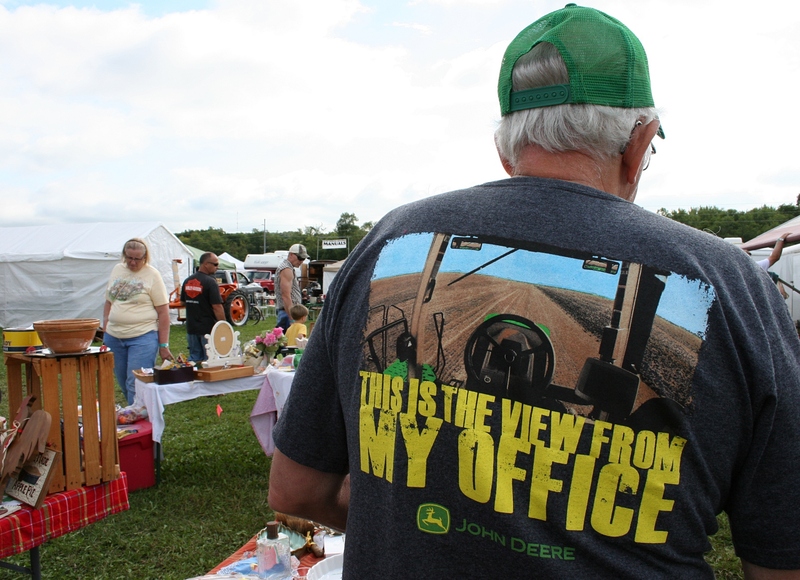 The Rice County Steam & Gas Engines, Inc., annual Labor Day weekend show, which continues through Sunday, brought back many memories for me as I wandered among tractors and flea market merchandise and more for nearly four hours Saturday. The young and the older guide a John Deere toward the parade route. Curve of a Surge milking machine. Putt-putt-putt of a John Deere tractor chugging along the tractor parade route. 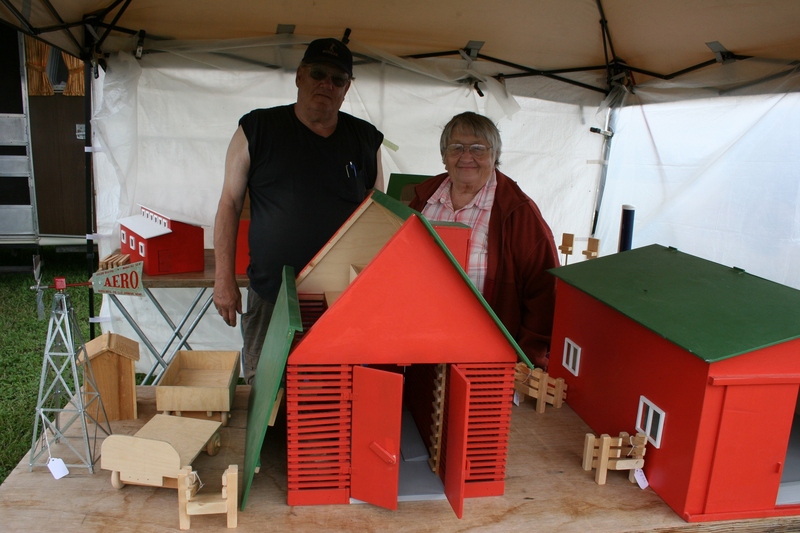 Al and Marlene Sutherland of Country Junction, Tripoli, Iowa, pose with the replica small scale farm buildings Al constructs. He taps into his memory to design and build the buildings. The corn crib in the foreground includes 400 pieces and sells for $200. 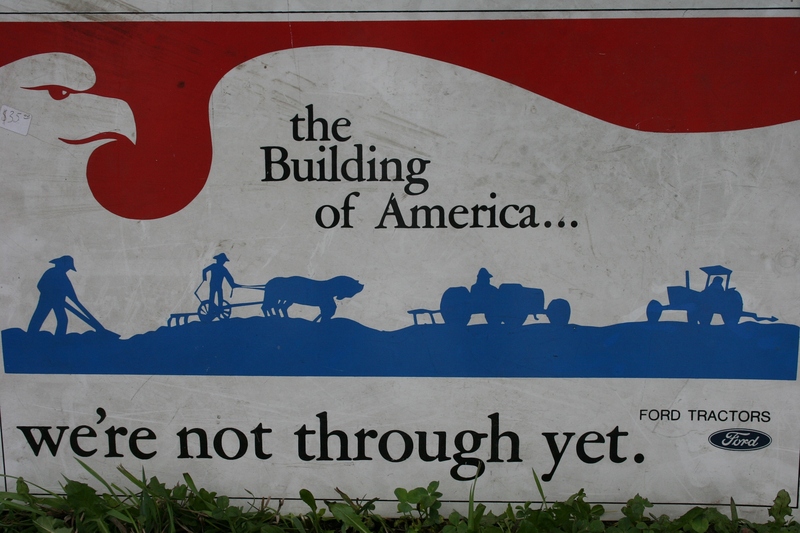 The agrarian lines of a corn crib. 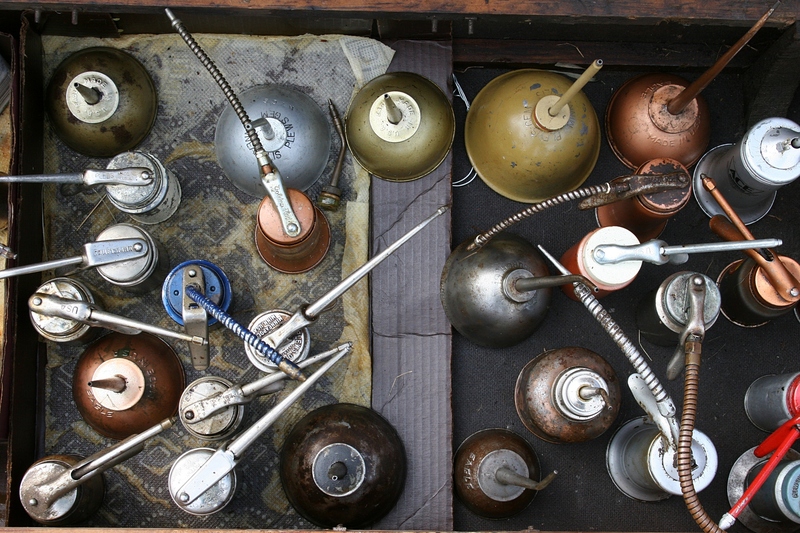 Vintage oil cans grabbed my attention at the flea market. A Midland oil can. An NFO sign. All so familiar. 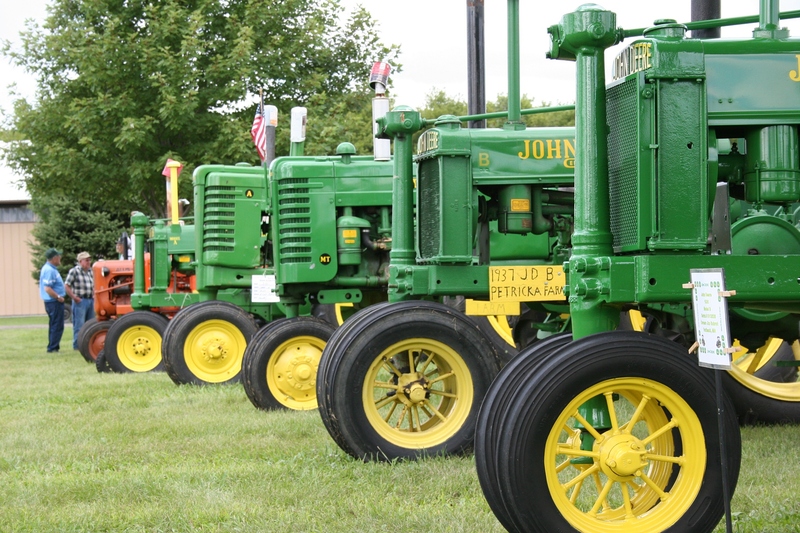 Rows and rows of tractors, including these John Deeres, line the grounds. As I paused to admire an aged, rusty John Deere, an elderly woman said the green machine brought tears to her eyes. 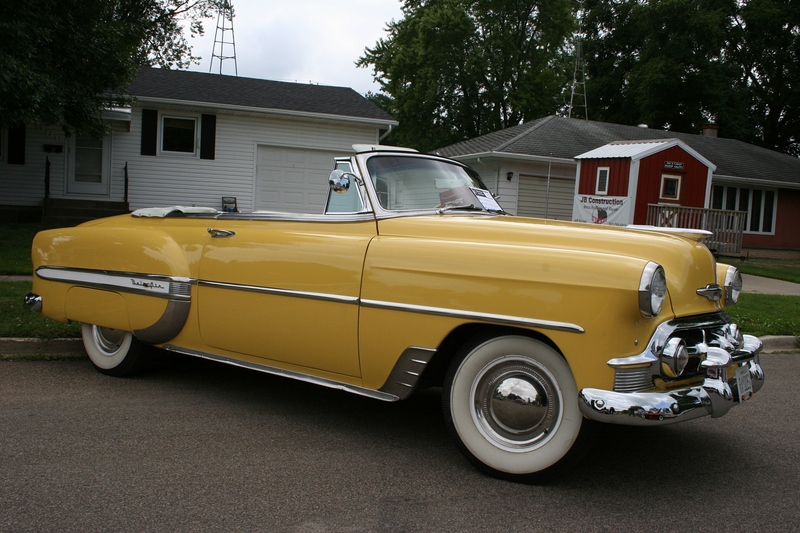 It was exactly like the one her father drove. 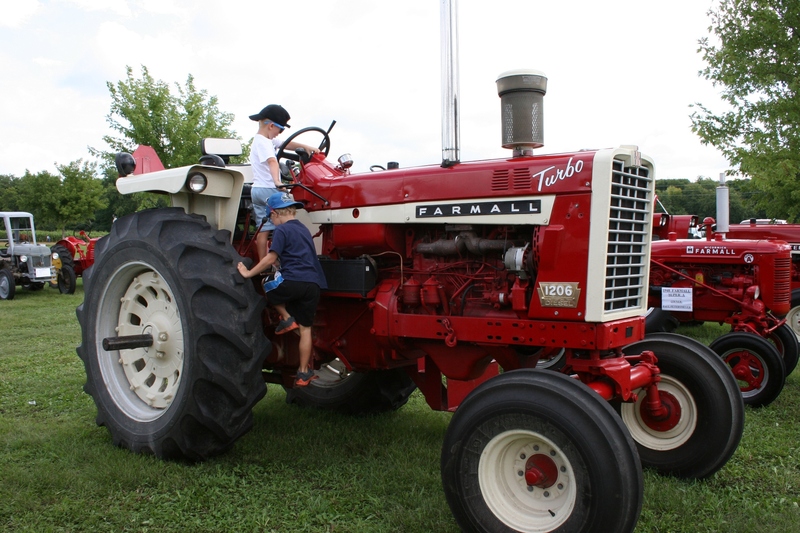 Brothers William and Jacob climb atop a Farmall. 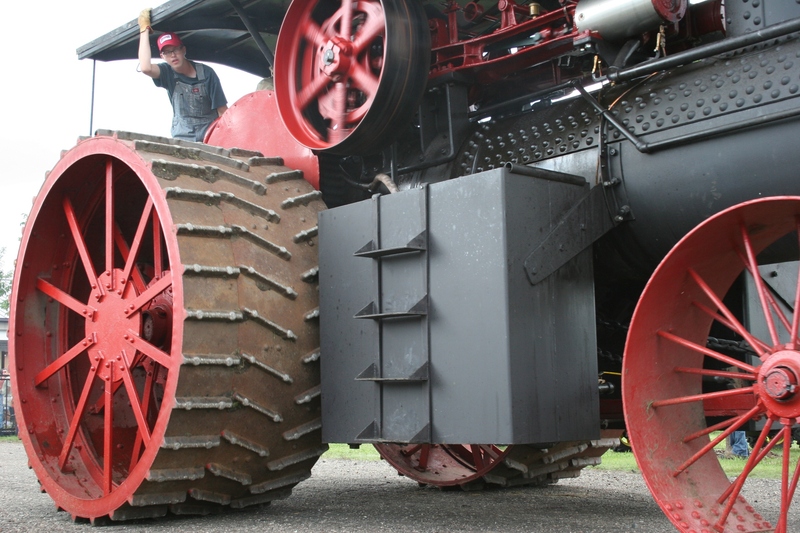 Nearby, grandparents smiled as their two great grandsons climbed onto a Farmall. Building memories. Several steam engines are part of the exhibition. 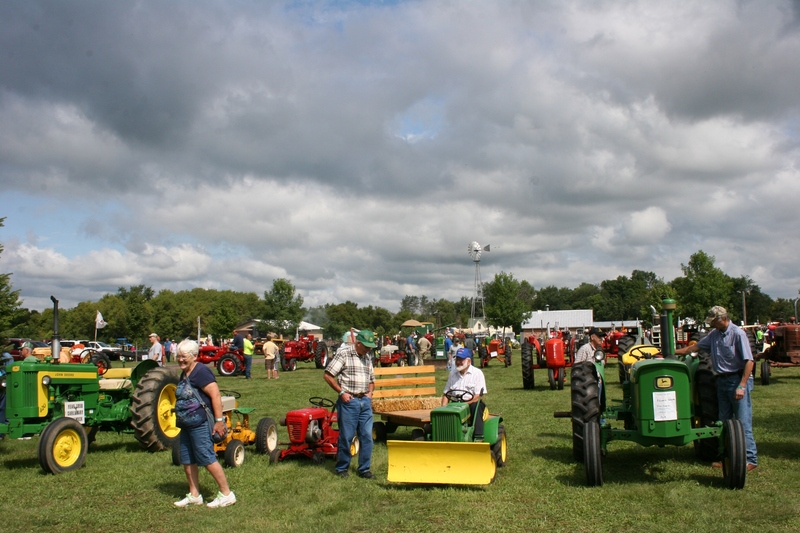 If you’re into farming of yesteryear and flea markets, then consider attending this event. 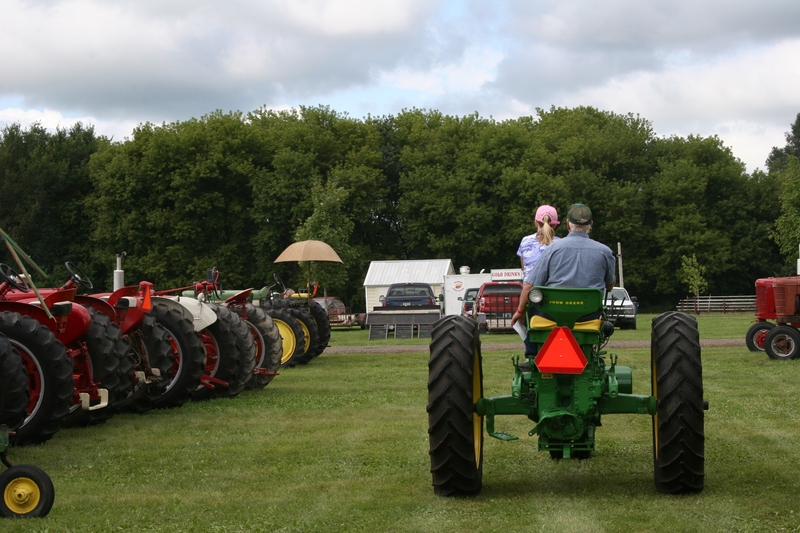 Gates open at 7 a.m. Sunday and close at 5:30 p.m. A tractor pull is slated for 9 a.m. Admission is $8 with 12 and under free. 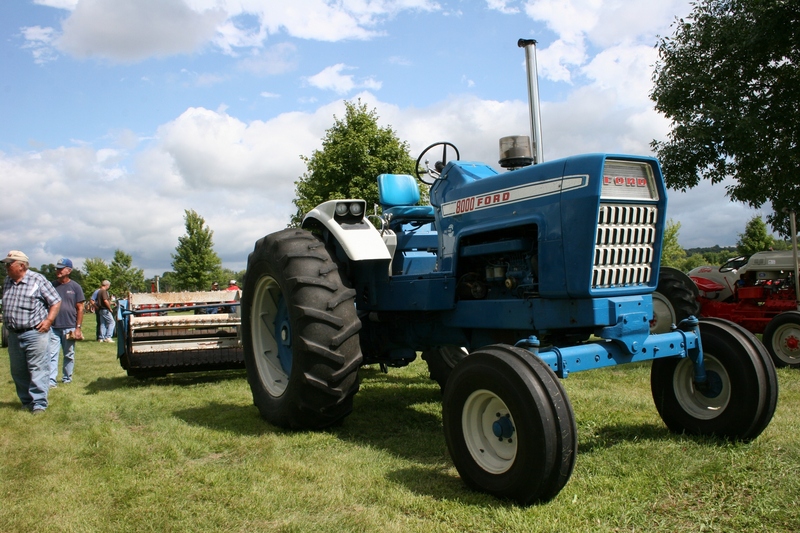 Fords, including this one from Westbrook Ag Power (where my oldest brother is part owner) were the featured tractor at this year’s show. This Ford is owned by a rural Northfield man. 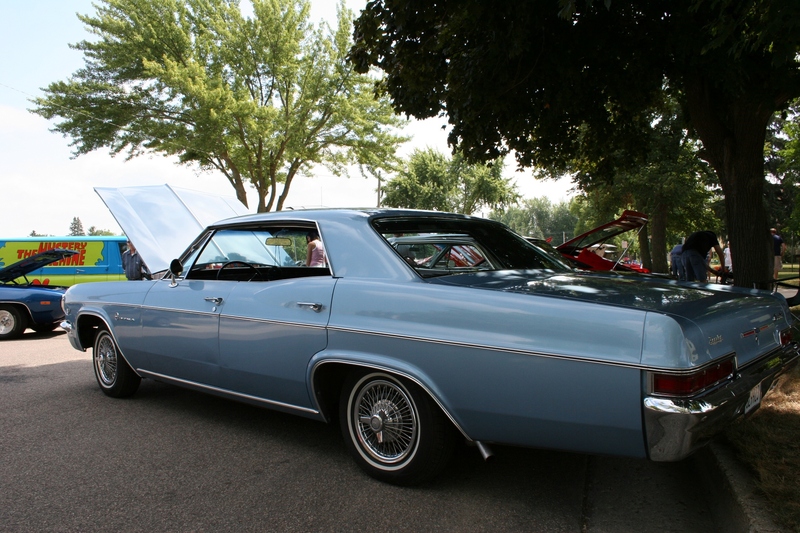 The show grounds is located three miles south of Northfield on Minnesota State Highway 3. For more information, click here. 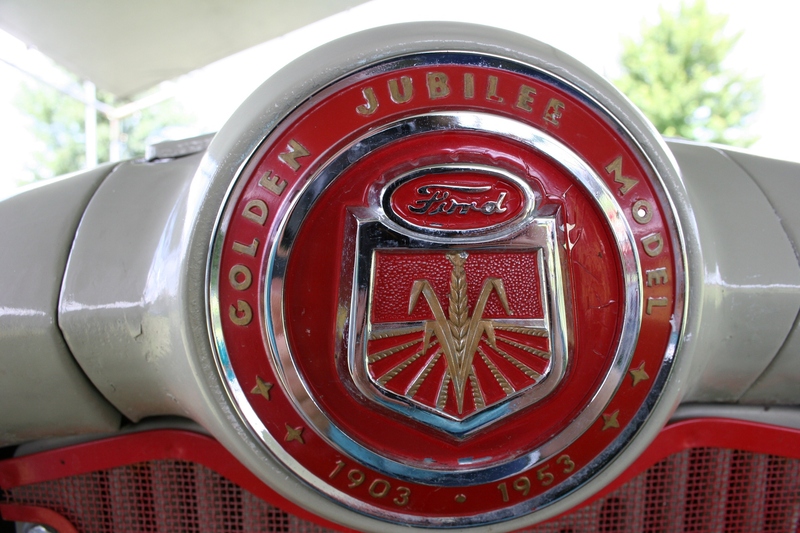 You can buy a chance to win a Golden Jubilee 1953 Ford tractor being raffled by Rice County Steam & Gas Engines, Inc. Checking out the Minneapolis Molines. My favorite t-shirt of the day. The show always offers photo-worthy rural fashion shots. 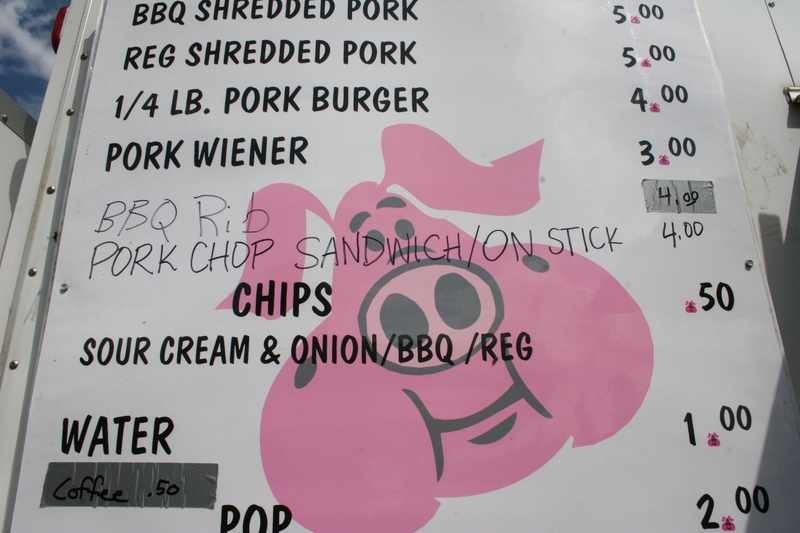 Every time I attend this show, I order a BBQ shredded pork sandwich from the Rice and Dakota County Pork Producers. 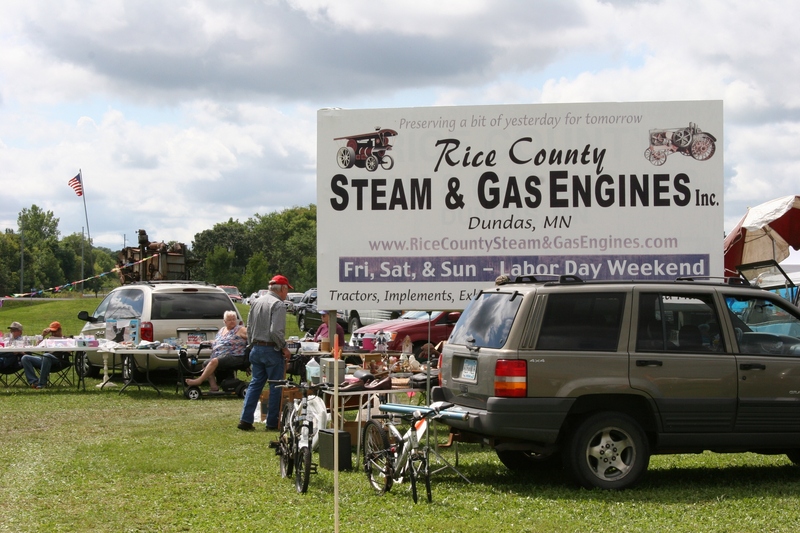 PLEASE CHECK BACK for more photos from the Rice County Steam & Gas Engines Show. GROWING UP IN A POOR farm family with five siblings, it wasn’t all that often we got ice cream treats in town. Maybe Schwans ice cream in a dish or cone from the basement/porch freezer. But not soft-serve at a walk-up/drive-up. 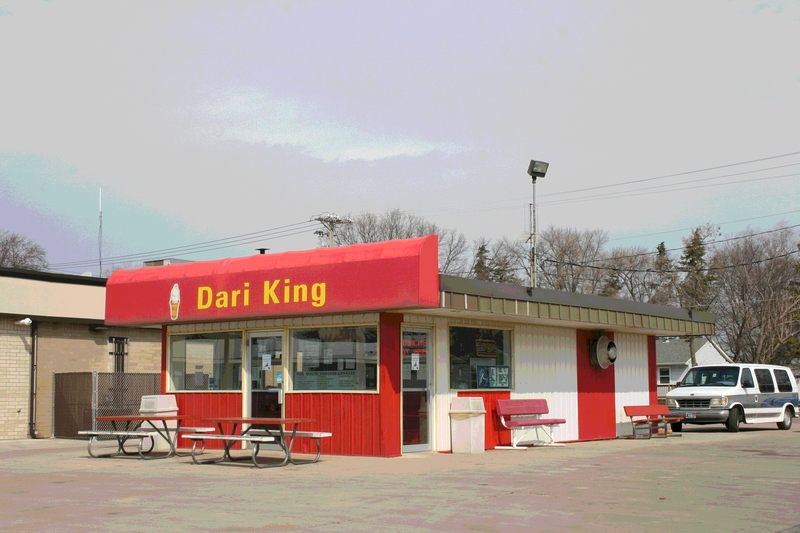 Occasionally, though, Dad would treat us to a cone at the Dari King in Redwood Falls. This was back in the day when a small cone cost a dime. But even then a dime was a dime was a dime. Forty years after I left the farm, the independent (non-chain) Dari King still stands, serving ice cream and more to the next generations. How sweet is that? I don’t get it. 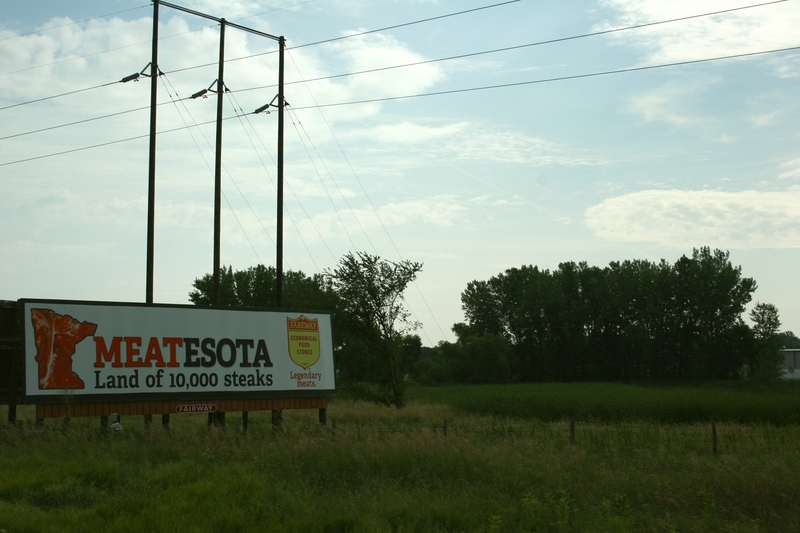 What 10,000 steaks? The thing is, I really do like Fareway’s meat, although I have yet to try a steak. I am not a big steak eater. But I certainly savor Iowa chops. If this is the Iowa based company’s effort to cozy up to native Minnesotans like me with a spin on our state’s thousands of lakes theme, then this fails in my marketing book. But I suppose in theirs it succeeded. After all, I noticed the billboard and now I’m writing about it. 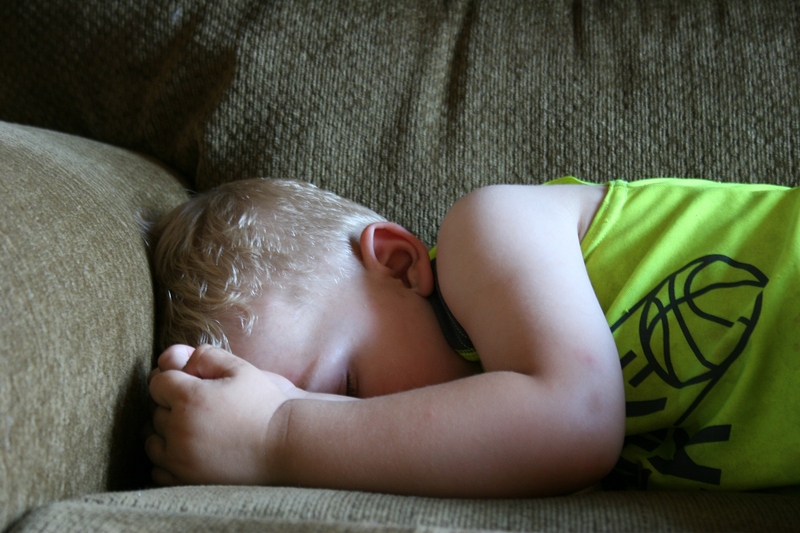 DON’T YOU WISH sometimes that you could be the carefree kid again? I do. 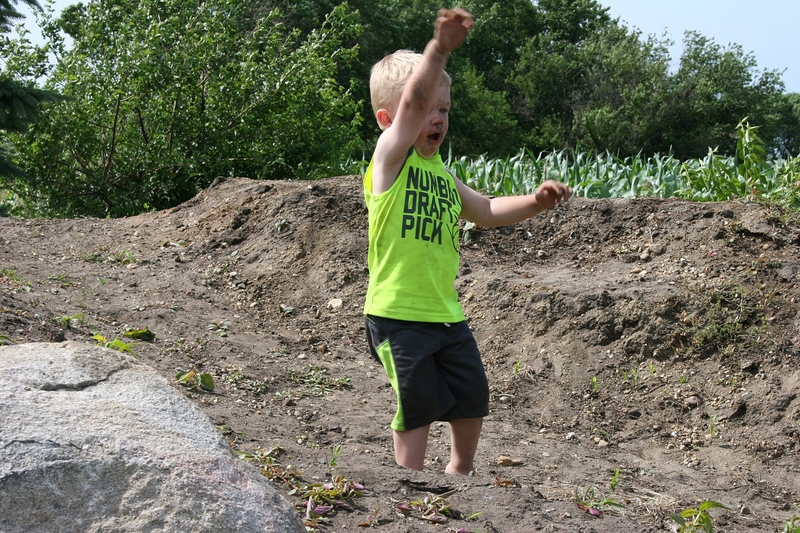 I wish I could be like my great nephew, Hank, with nothing to worry me—climbing dirt piles, tossing clumps of dirt, running here and there as fast as my short legs can move me. 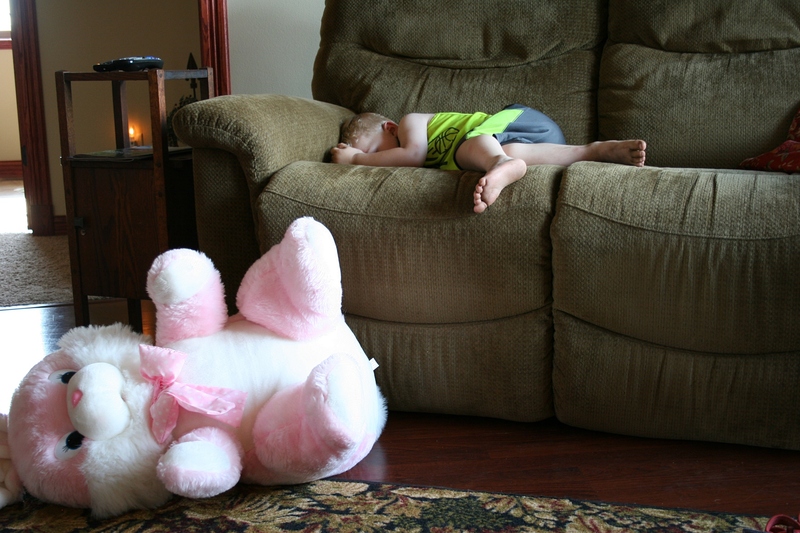 And then when I was all tuckered out, I’d slip inside the house and cuddle a plush toy before settling onto my mother’s lap. My head would dip and nod against her until I fell into sweet slumber. Then she would ever so gently lift me from her lap and snug me onto billowy cushions, my curls pressed against the armrest, my fingers furled against my forehead. 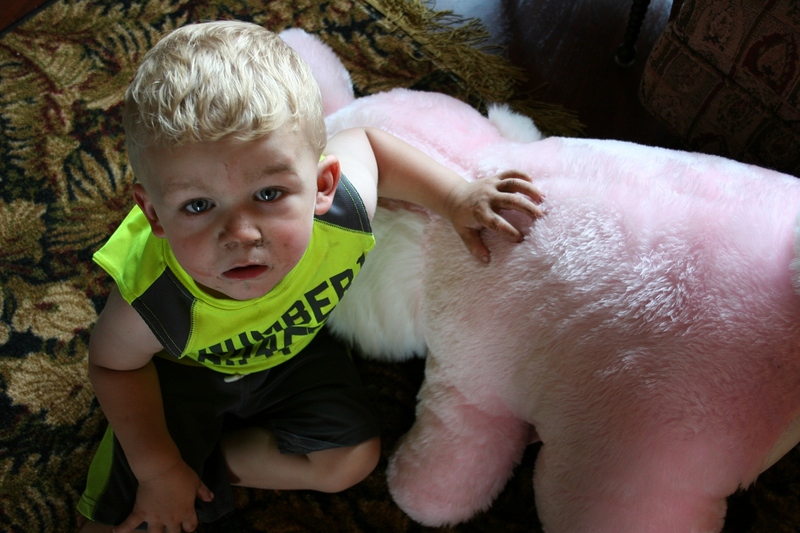 I know I can’t be two again. But I can dream. 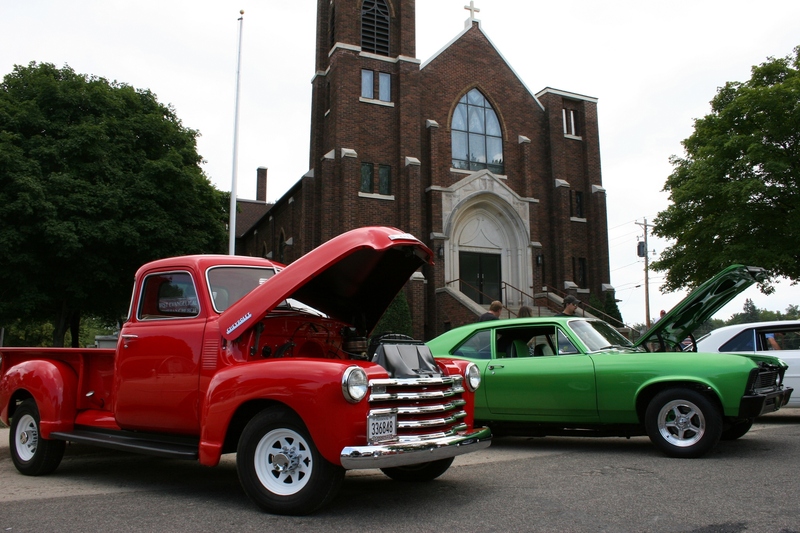 Vintage vehicles lined several blocks of a residential neighborhood just off the main drag, Minnesota State Highway 60. 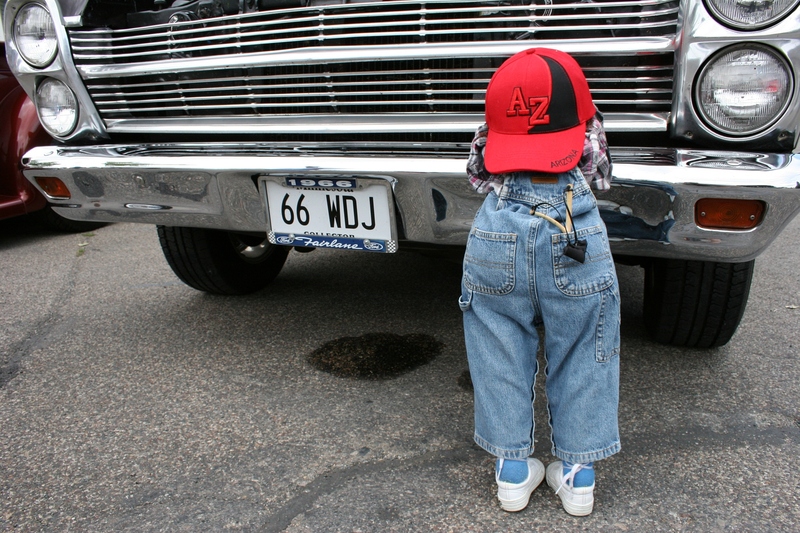 The location was perfect for those wishing to check out downtown Kenyon. 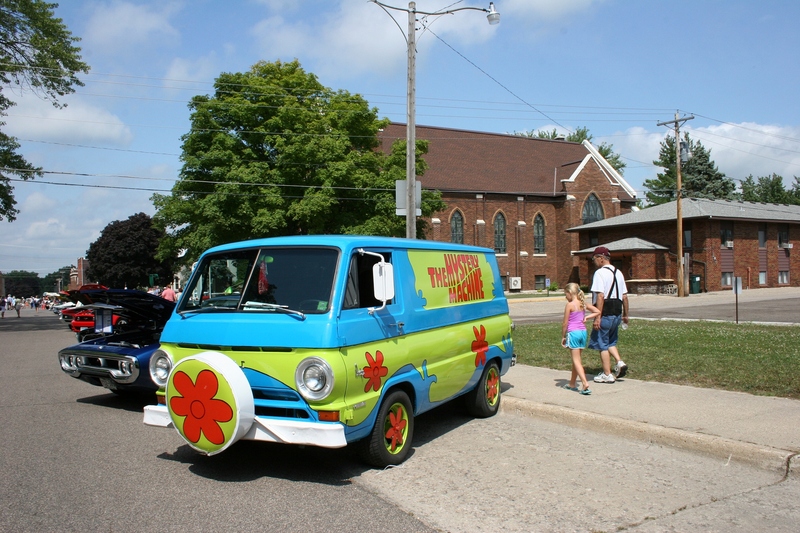 A RECENT CAR SHOW in Kenyon, at this southern Minnesota community’s annual Rose Fest, presented a multitude of photo ops. I’m always drawn to details like this die on a lock. I focused on the shiny, the unusual, the beautiful, the interesting, the whatever caught my eye. 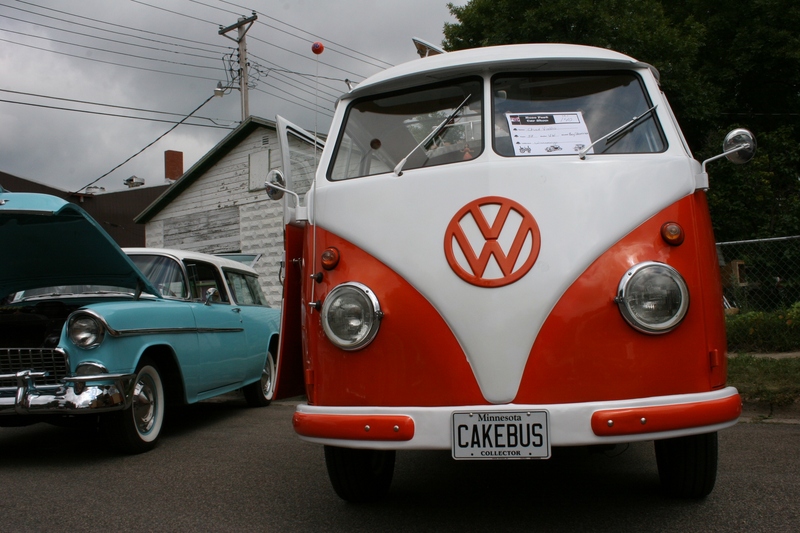 I called this a hippie van. And between all that photographing, I met John, a former co-worker of my husband, and John’s wife, Diane. John and Randy had not seen each other in something like 35 years, when they worked together at a Rochester automotive parts store. John recognized Randy first. It was a wonderful moment, to see these two guys reconnect. So sometimes it is not all about the cars. It is about the people and the moments. And rats if I didn’t fail to photograph that reunion. 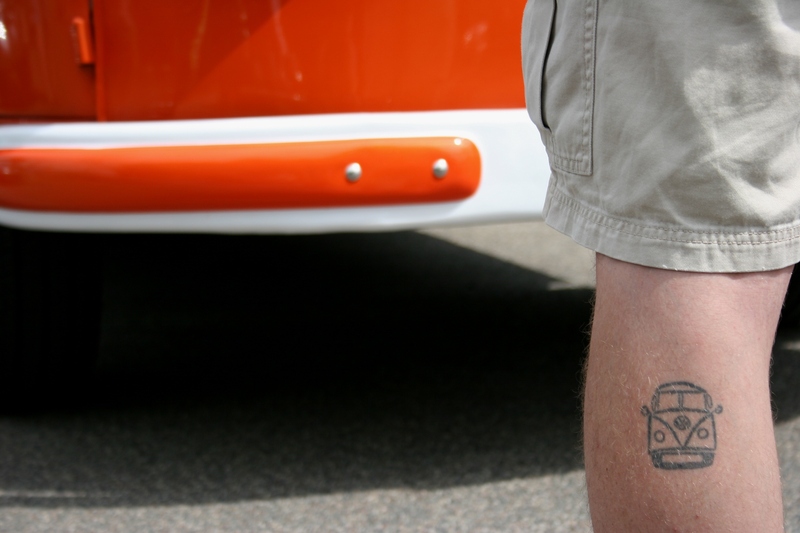 Enjoy these images from the Rose Fest Car Show, minus John and Randy. 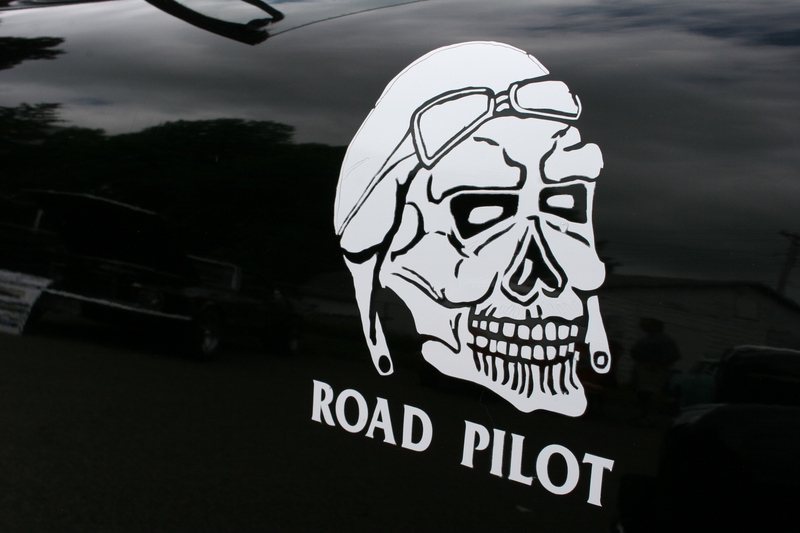 I prefer original, but some guys like to modify their cars. 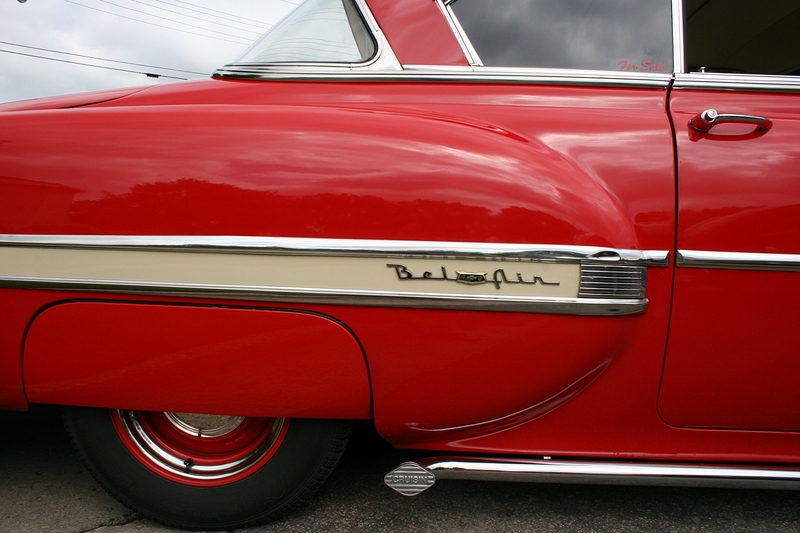 Love the graceful curves of this Bel Air. 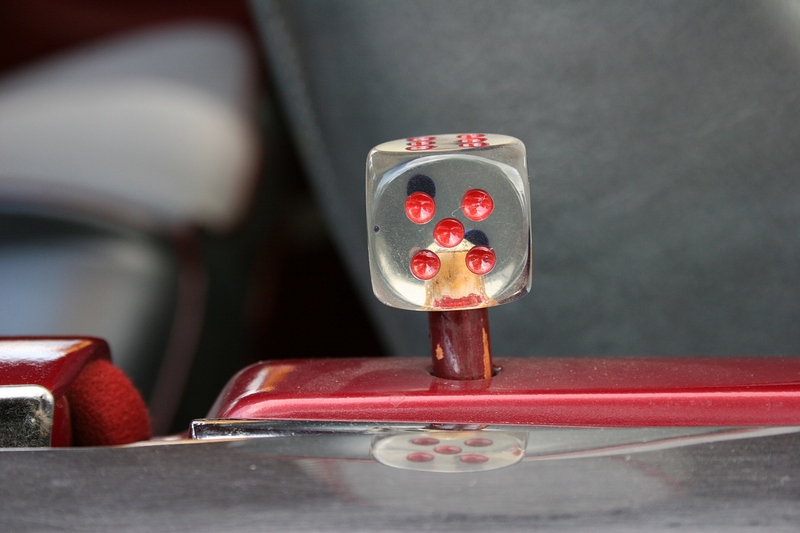 A mini version of the car always draws my artistic attention. 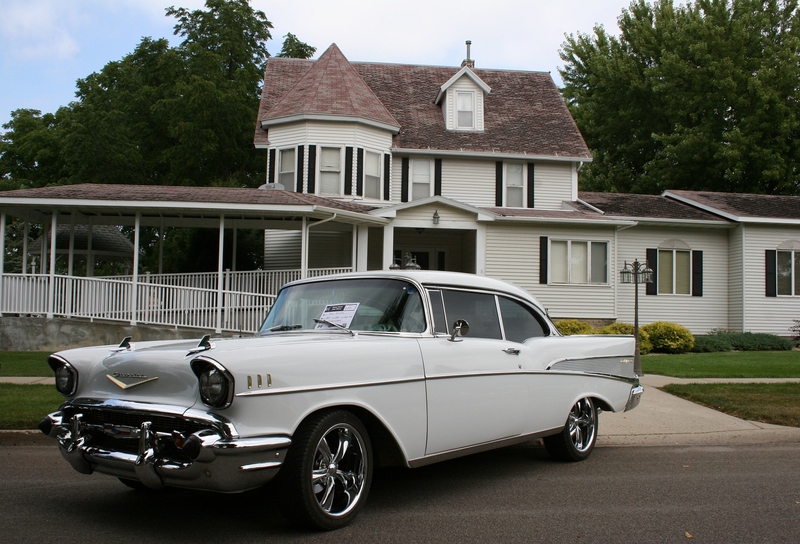 Composing this image, I appreciated the melding of car and beautiful house. Turns out the house is a funeral home. 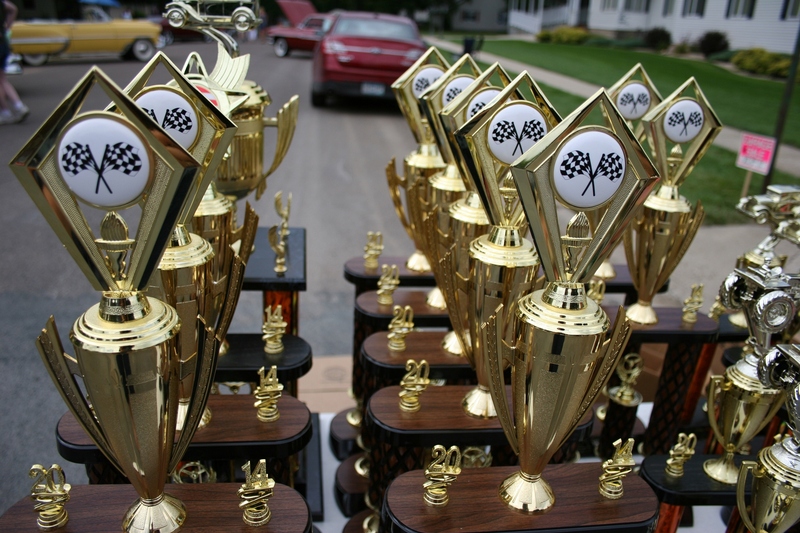 So many trophies I wondered if everyone gets one. 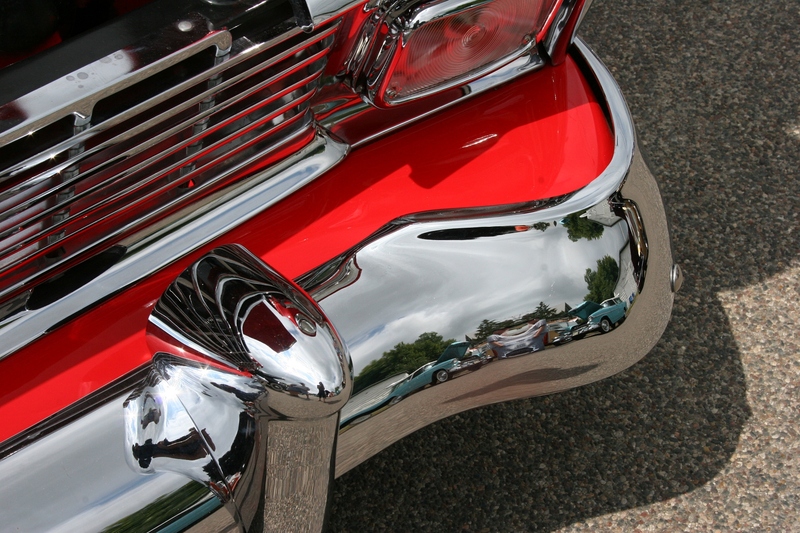 I’m ever watchful for shiny bumpers and reflections. 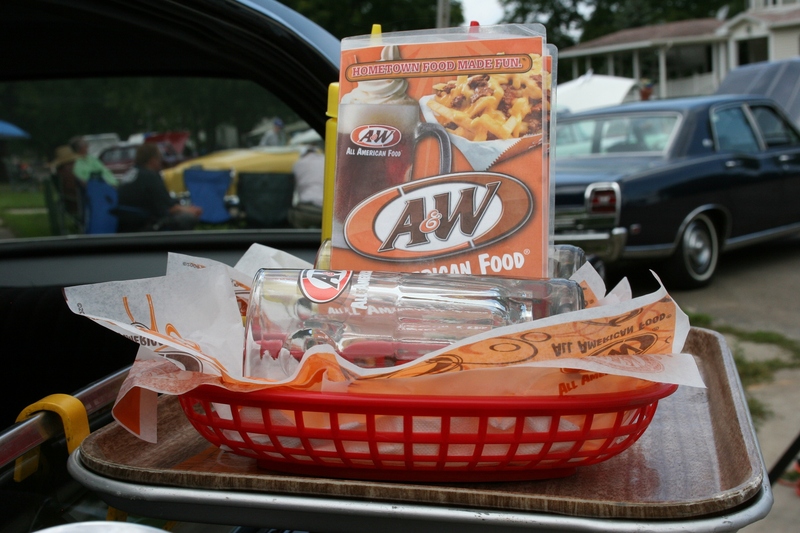 Remember going to the A & W drive-in? I still don’t understand this staging. 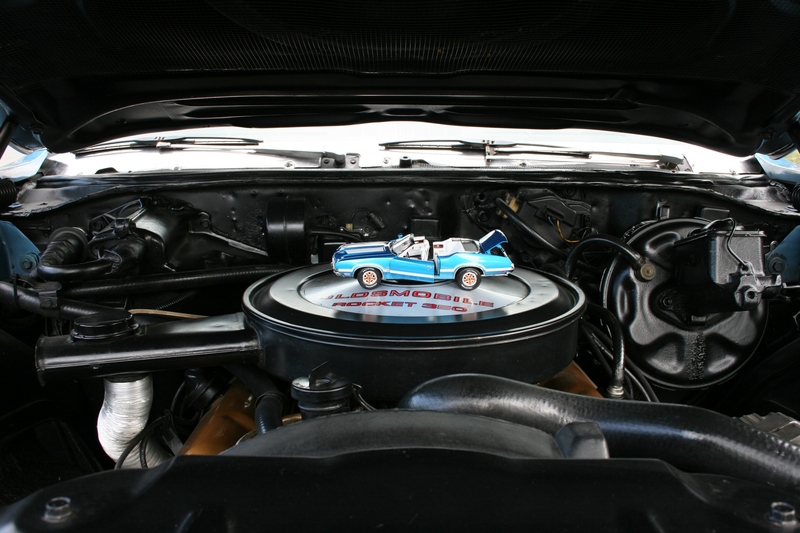 A Chevy my husband likely wishes he owned. 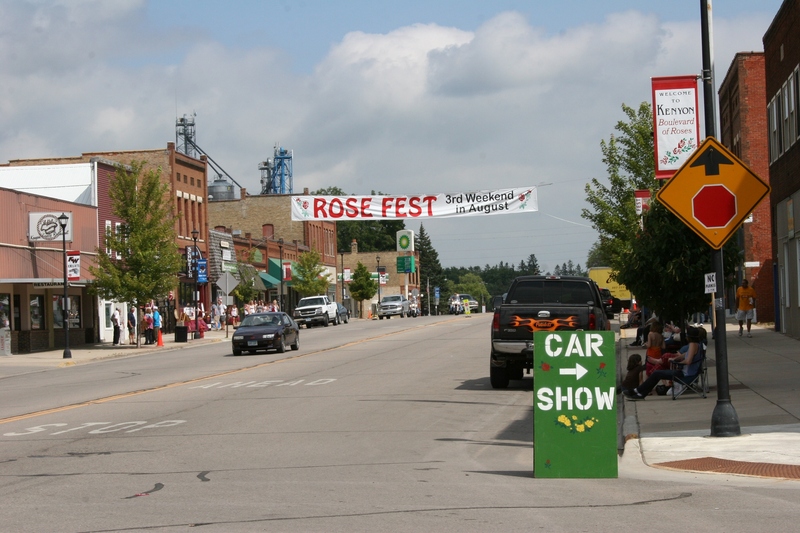 Kenyon, Minnesota, welcomes visitors to its recent Rose Fest. 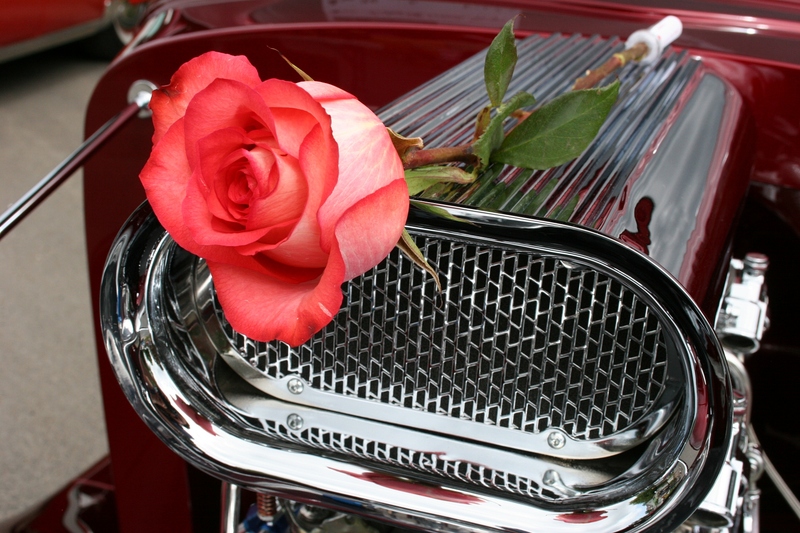 WOULD YOU EXPECT to find roses at a car show? One of many beautiful roses spotted at the car show. 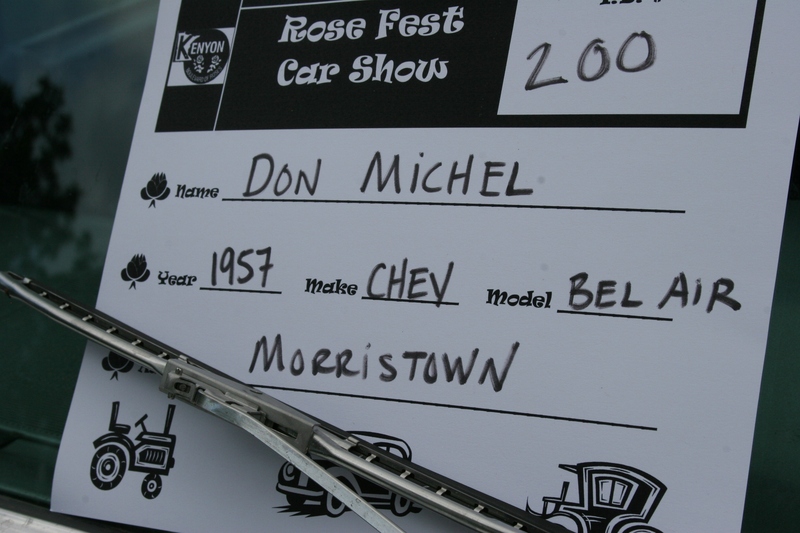 But in the small southern Minnesota community of Kenyon, organizers of the Rose Fest Car Show handed out roses to early arrivals. How sweet is that? An unexpected surprise. 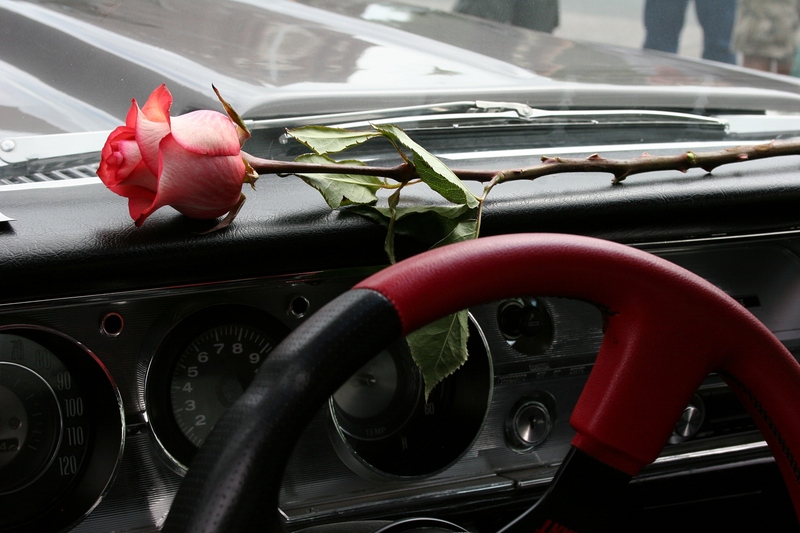 A rose on a dashboard. 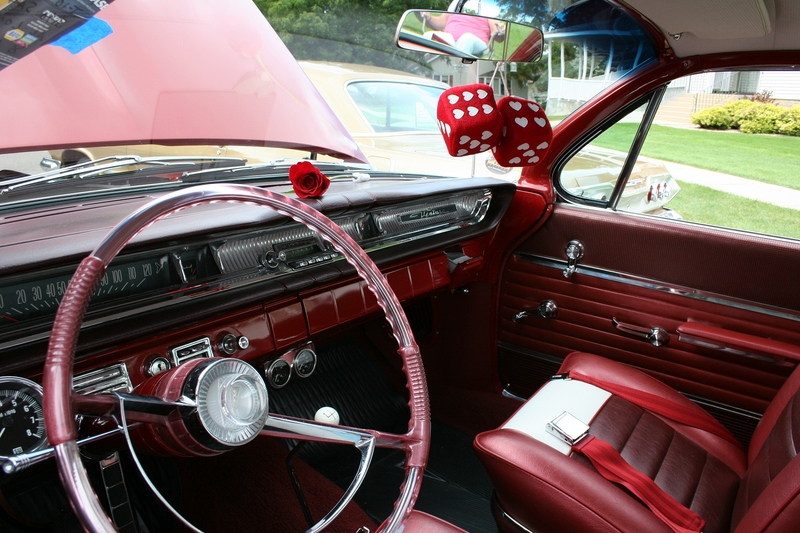 A rose lying on a car seat. A rose on an engine. 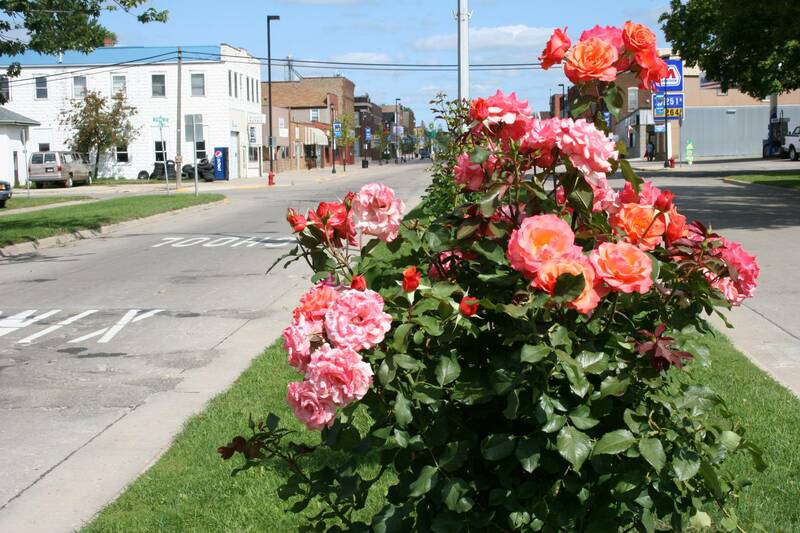 Kenyon’s Boulevard of Roses cuts through Minnesota Highway 60. Minnesota Prairie Roots file photo. 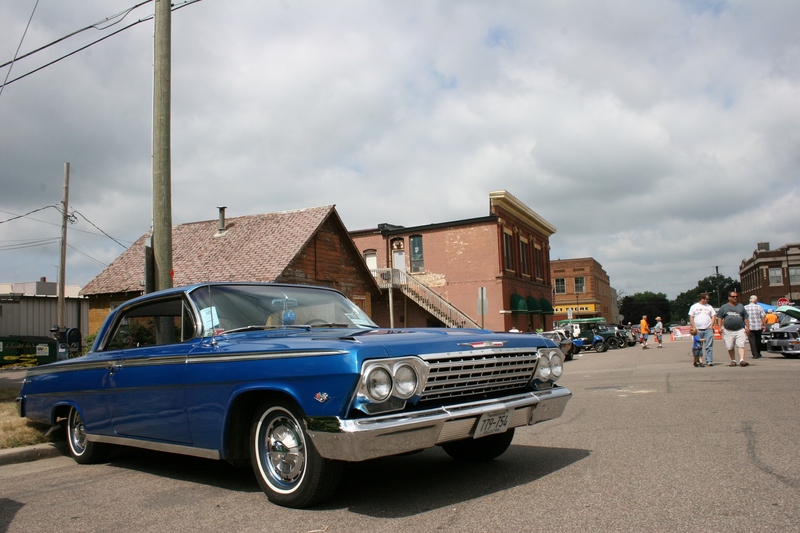 Now I’ve been to quite a number of car shows, but never to the one in Kenyon, where roses are planted for blocks in the boulevard of Minnesota State Highway 60 running through the heart of town. This car show impressed me. I can’t pinpoint precisely why I so enjoyed this show. But I found lots to draw my eye from the quirky to the nostalgic to the shiny and more. 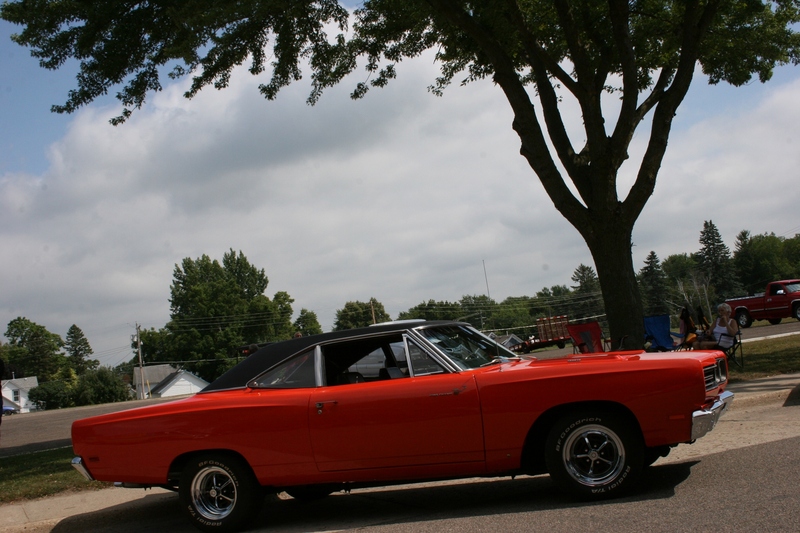 Enjoy these images from the Rose Fest Car Show. And then check back tomorrow for more photos. My absolute favorite moment, and shot. 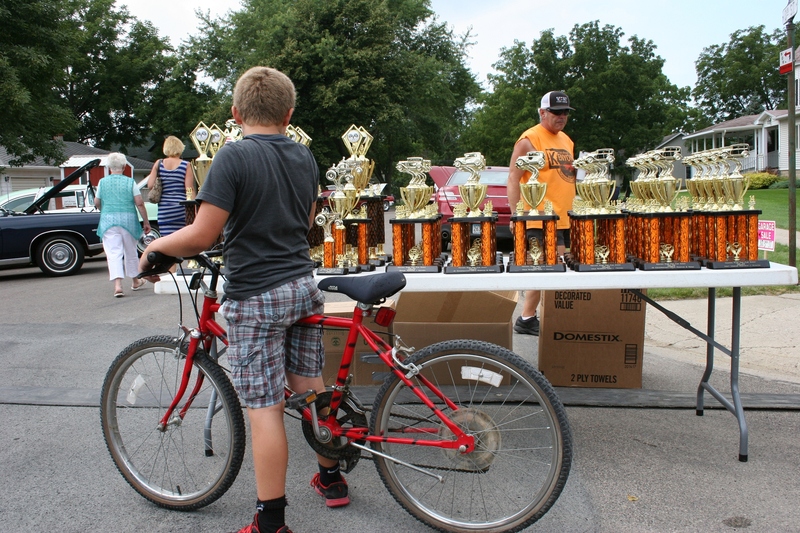 This boy was so immersed in admiring trophies that he didn’t even notice me. 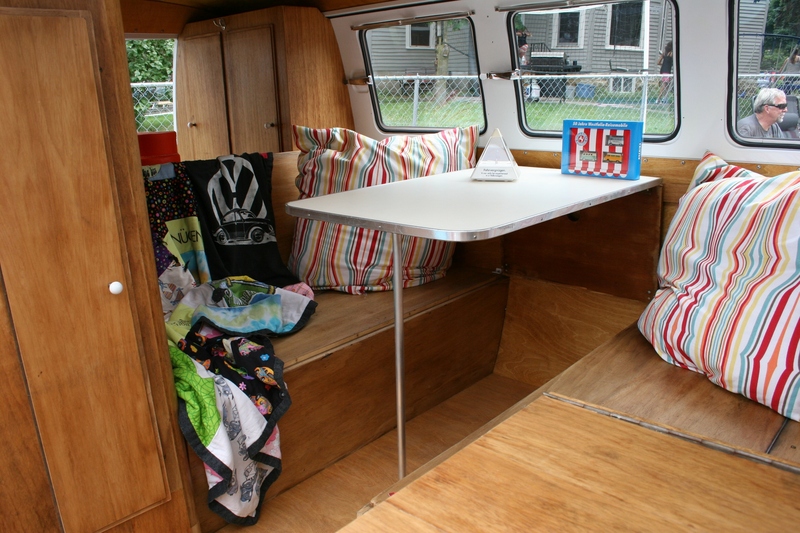 …and this inside, all ready for camping. Definitely not as family-friendly as Chad’s VW bus art. Another favorite of mine, the Roadrunner. 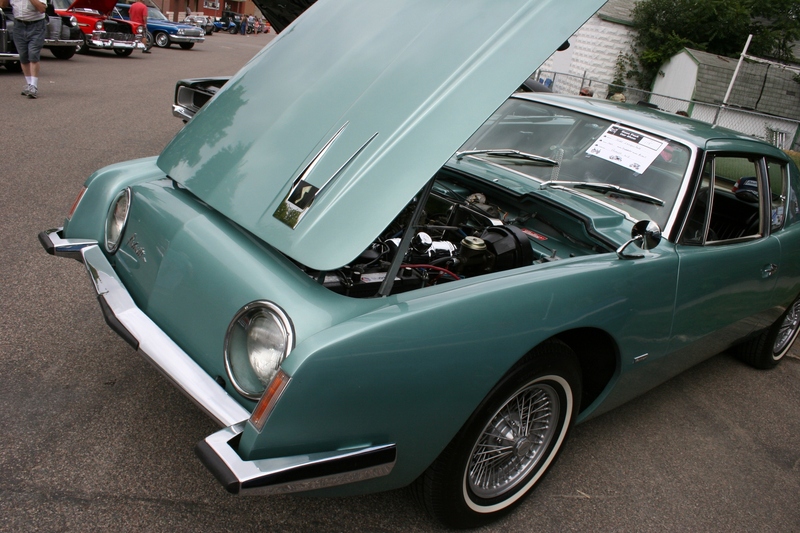 Every vehicle is marked, so if you’re a serious student of vintage cars (I’m not), the necessary info is right there. 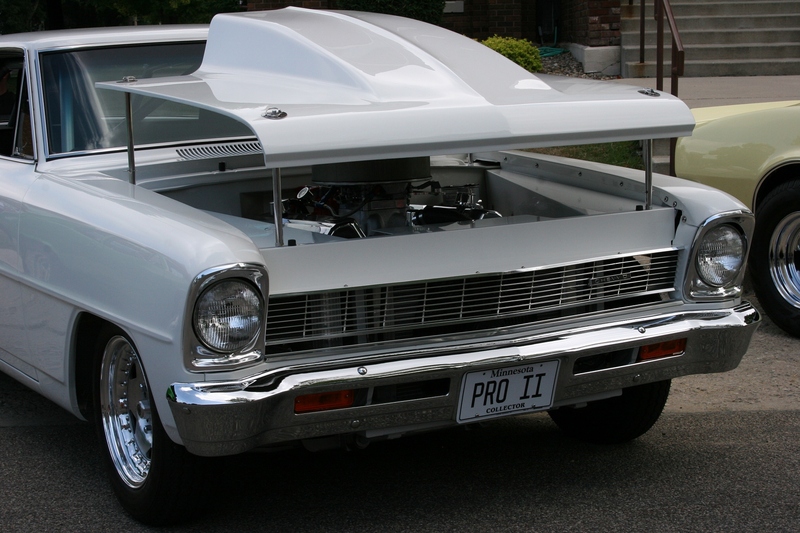 I’ve never seen anything like this backward opening hood. Me with my mom in late May. AS THE DAUGHTER of an aging parent, it is the call you do not want to get—that your mother has fallen and is being transported 130 miles via ambulance to a metro area hospital. That exact scenario played out earlier this week when my octogenarian mom fell in her assisted living room and suffered multiple severe injuries that landed her in a trauma unit. It’s been a difficult week. Worrying. Waiting. More injuries added to the initial list. Questions. Tests. Rest, recovery, therapy. So many emails, text messages and phone calls have been exchanged among siblings, other family members and friends that I’ve lost count. And prayers, lots of prayers, prayed this week. 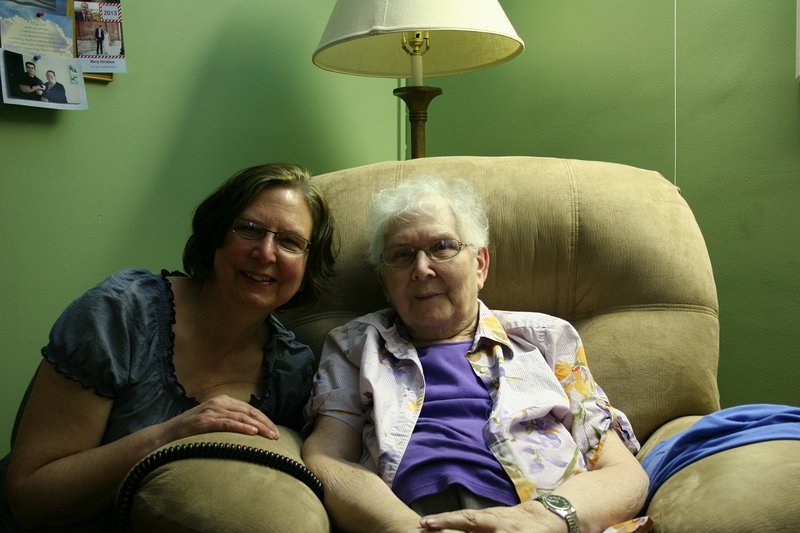 In the end, Mom, who has faced many medical challenges throughout her years, rallied. Today she is back in the care facility where she moved earlier this spring. She is happy to be home. The staff in this rural small town facility welcomed her with open arms. I am grateful for their concern and care. And I am thankful for answered prayers. I believe strongly in the power of prayer and the faithfulness of God. So many times this week, I found myself requesting prayers for my Mom and asking for God’s healing hand upon her. Those prayers continue now for her recovery. I have not seen my mother; she did not want visitors. She realized her need to focus on rest and recovery. That was difficult, but for the best. However, I have seen photos of a woman who appears to have been on the losing end of a bar brawl. She claims to have been scrimmaging with the Minnesota Vikings. It’s good to laugh in the midst of challenges. And my mom faces the challenges now of recovery, of ongoing physical therapy, of regaining her strength. Her goal is to attend her granddaughter’s wedding in a few weeks. I have no doubt she will achieve that goal. She is a strong woman. FYI: The online news source, MinnPost, published an interesting story today in a late-in-life healthcare series. 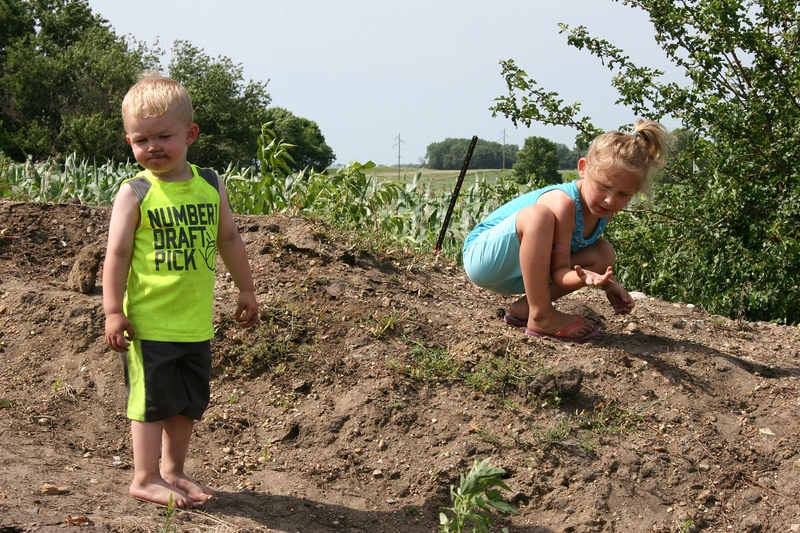 The piece focuses on options for those living in rural Minnesota. I’d suggest you read it by clicking here. With families today often living far apart, rural elderly face challenges unlike those of previous generations. I live about 125 miles from my mom.